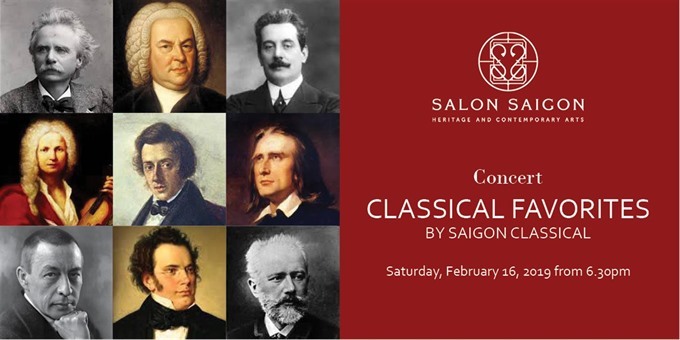 The music night “Classical Favorites” will be held from 6.30pm to 8pm on February 16 at Salon Saigon on 6d Ngô Thời Nhiệm St in HCM City’s District 3. HCM CITY — The “Classical Favorites” music night will be held from 6.30pm to 8pm on February 16 at Salon Saigon on 6d Ngô Thời Nhiệm St in HCM City’s District 3. The performance includes classical music and visual arts in an inspiring artistic venue. The concert programme is curated by Saigon Classical, an organisation that brings Vietnamese classical performers to the public sphere and creates a platform for classical music lovers in the city.